If you are looking to hire a pottery wheel in London, you probably have more options than you've initially thought of. Pottery wheels can be a really expensive investment in terms of infrastructure and can be a big commitment if you aren't sure you'd like to commit to pottery. We do recommend trying out a pottery class first, to make sure that you gel well with clay as a material and want to continue to use it as a medium in the future. The open access studio model allows people to drop in an use a pottery studio on a come and go as you like kind of basis. This is ideal for people who are fitting in pottery as a hobby or an alternative to their regular job or around family life. It gives you the freedom to use the studio when and for as long as you would like, with no time constraints within the contract. A little like how you would expect to use a gym, the open access model allows you to hire a pottery wheel on a month by month basis, with no long-term commitments, and no restrictions on timings or ability level. Benefits to hiring a pottery wheel this way as well comes with the fact that you don't have to worry about the mess or space that it would require to have one in your own house. There are other benefits that come with it as well, including the fact that you have access to other materials and equipment you would need to complete your pottery projects, including access to a kiln and storage whilst you are waiting for the clay to dry out. For people who live without access to their own private studio, this is a great option if you are looking to hire a pottery wheel so that you personally can further your own skills or knowledge of wheel throwing. Are you putting on an event and would like to provide entertainment in the form of a pottery wheel. Various potters teach classes and are willing to provide the materials and equipment needed to teach a bespoke pottery class outside of their own studio. Both Clover Lee and Nam from Cernamic are willing to take their wheels and equipment out to various different events if the price is right. Another thing that potters are brilliant at is getting involved to do demonstrations of their skills. So if you are looking to hire a pottery wheel, alongside with a talented ceramicist to put on a demonstration, then send us an email to hello@obby.co.uk and we will put you in contact with all our pottery teachers who are willing to do that. If you'd like to arrange a short-term contract to get a few extra potter wheels for your studio for summer, you have one of two options. You can make the initial investment, and sell them on later, or approach a pottery studio and ask them if they have any spares they would rent to you for a certain amount of time. The pottery community can be extremely friendly, and every one is always ken to help each other out. If you'd like us to try an arrange this for you, email us at hello@obby.co.uk and would love to put you in contact with some of our larger studios, who might be keen to lose a few pottery wheels in return of making some guaranteed cash. Pottery wheels can be very expensive. There are differences in wheels so you'll want to determine your needs then look for the wheel that best meets them for the best price. Potter's wheels are a major expense; be certain to comparison shop. Check with several online suppliers, as well as local ceramic and artist suppliers. Don't forget to compare the cost of freighting as well as for the potter's wheel itself as that can sometimes add a substantial amount to your purchase. 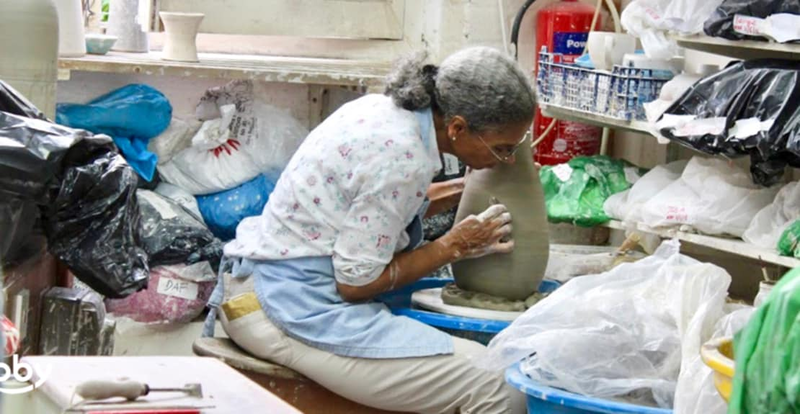 Pottery crafts is a great website to find everything and anything you can possibly imagine you might need to open up your own pottery studio if you have the cash to do it. For a cheaper option, head to Gumtree or eBay to look for second-hand ones.